Back in 2005, my best friend and her family decided to relocate to Nelson from Vancouver – a 7 hour drive away. I wasn’t thrilled at the prospect of her moving so far away but, the silver lining was having an excuse to visit this beautiful little part of the world (and have a place to stay!). On one of my visits, we had popped into the local bookstore (yes, on that busy little main street aka Baker Street, and no, not a Chapters/Indigo or Coles) so her daughters could each pick out a book – my gift to them whenever I visit. While the girls were making their choices, Laura pulled a copy of Whitewater Cooks by Shelley Adams off the shelf and asked me if I’d seen it. 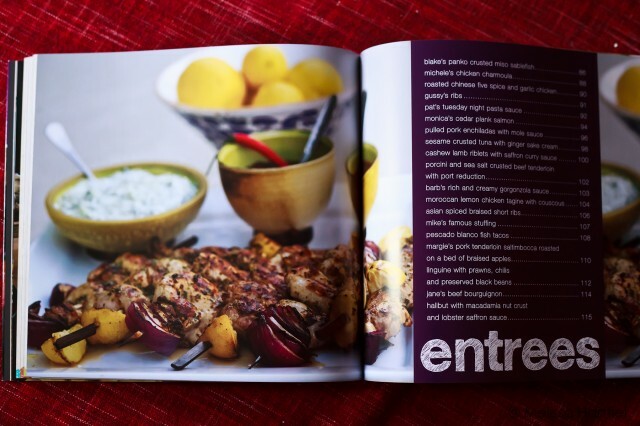 I hadn’t but it was a beautiful cookbook with mouthwatering photography. Laura mentioned that she’d really like to have it and I, who had been thinking about a thank you gift to leave her before I went home, made a mental note. I snuck back down the hill the next day to pick up a copy to give her before I left, which netted me a big hug upon departure – successful giftgiving all round! That was my first introduction to Shelley Adams’ Whitewater cookbook series. Nelson is also home to some of the best skiing in N. America and Shelley and her husband owned the Whitewater Ski resort just outside of town. Shelley operated the Fresh Tracks Cafe at the resort and when skiers kept pestering her for the recipes for her food, a friend suggested she write a cookbook. So she did – Whitewater Cooks. And then she wrote a second one: Whitewater Cooks At Home. And that was followed by book number three: Whitewater Cooks With Friends. Her books are consistently on the BC Bestsellers list (Whitewater Cooks with Friends currently sits at #2 as of this writing). Whitewater Cooks With Friends focuses on just that – the act of sharing food with those we love. The recipes are mostly quick to prepare (some require a little pre-cooking prep time) so you can spend time with your family and friends instead of in the kitchen. Many of the recipes were contributed by Shelley’s friends and family – some professional cooks, some not. Isn’t that what food is all about? Sharing recipes, feeding those we love, spending time preparing dishes together. So far, I’ve made two dishes from the book. 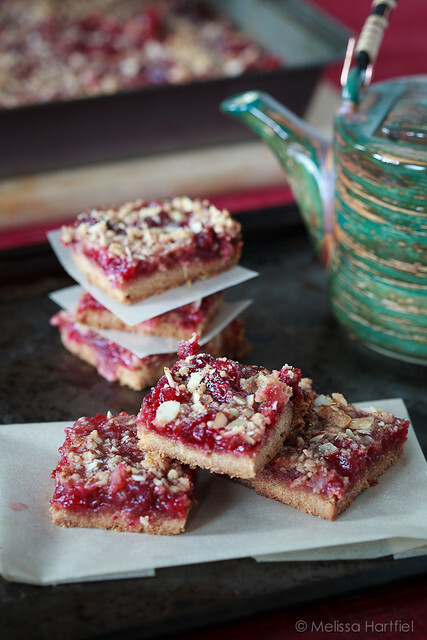 I started out with Pauline’s Cranberry Crumble Bars. I find as I get older, I love desserts that have a tart/sweet contrast and I love cranberries. And I started with a dessert because frankly, the sweet stockpile in this house had dwindled down to non-existent. I. LOVED. THESE. BARS. These are sooo going into the regular rotation. They were so easy to make, they baked up like a dream AND… they sliced like a dream!! I was a bit suspicious at first because the cranberry filling is very runny when you pour it over the base but it cooked up so well. You all know I’m bar challenged when it comes to slicing them but these were perfect. They had a really great balance of tart and sweet and the texture was so good. Everyone who tried them pronounced them to be excellent. 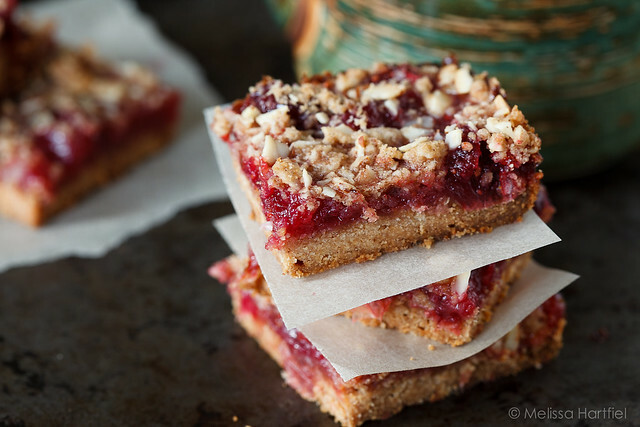 I am already plotting ways to change up the fruit filling because I think the base and topping will be my new “go-to” recipe for future bars. 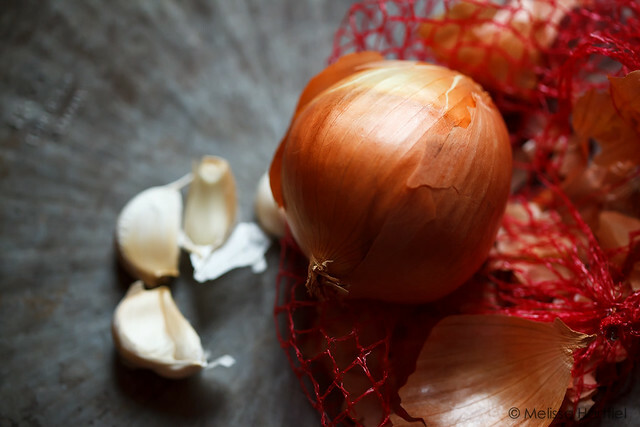 You know if it starts with onions and garlic it's gonna be good! Next up was the Linguine with Prawns, Chilis and Preserved Black Beans. I have to confess, this is where my whole “testing a bookbook” thing went to pot. I couldn’t find preserved black beans nearby and didn’t have time to head out to T&T Market so I wound up subbing black bean sauce. I also totally forgot to buy Romano Cheese so subbed Parmesan. So right there I was down two of the main ingredients. I made it with the healthy brown pasta so it doesn't make as pretty a picture but it was still awfully colourful! The dish consists of prawns sauteed with chilis, garlic, onions, fresh tomatoes and the beans (or black bean sauce in my case). Arugula is tossed in just before serving and stirred just enough to make it wilt. 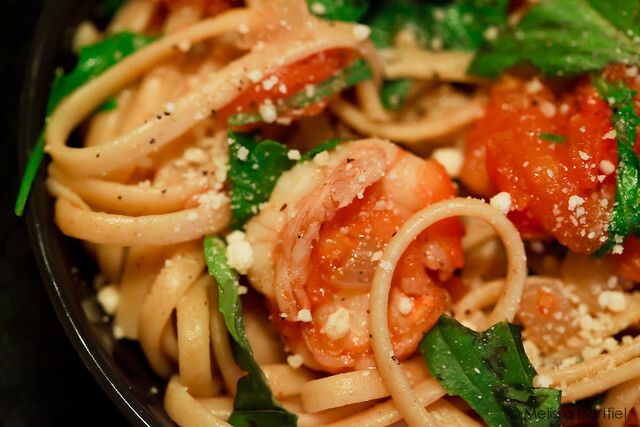 Topped with fresh basil and the cheese it’s a very quick, easy and flavorful dinner. Literally 20 minutes – and most of that is waiting for the linguine to cook. I think is would have had a little more bite to it if I’d had the Romano cheese – the Parmesan was too mild – but that was entirely my fault. But otherwise, this was also voted a success and… it was delicious warmed up as leftovers the next day when the flavours had combined even more overnight. I’m anxious to try it again with the preserved black beans to see how different it is. Next up, this weekend is Margie’s Pork Tenderloin Salitmbocca Roasted on Braised Apples. I also have my eye on the Asian Spiced Braised Short Ribs, The Moroccan Lemon Chicken and pretty much the entire salads and soups chapters. The salads all look like perfect summer lunch or dinner meals. I’ll do a part two when I’ve had a chance to try a few more of the dishes. The book itself is worthy of coffee table status. I’m an extremely visual person so I never buy a cookbook that doesn’t have photos for at least 80% of the dishes (and I virtually never make the ones that aren’t photographed). But the images in this book are simple and beautiful – the food is the focus and there’s none of the over production that seems so prevalent lately. 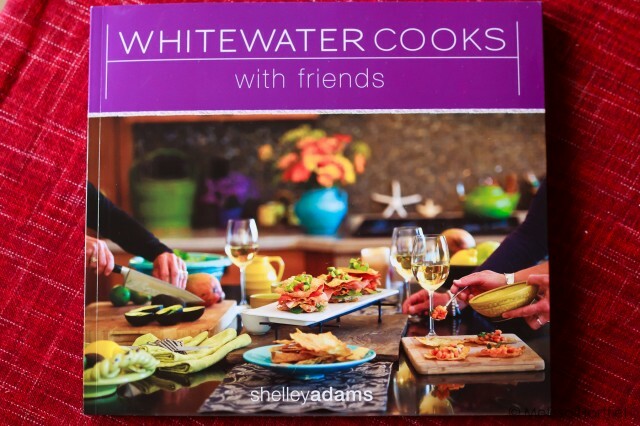 You can find Whitewater Cooks With Friends for sale on Chapters.ca, and Amazon.ca. Disclosure: I was given a review copy of Whitewater Cooks With Friends but all opinions stated in this review are mine. Wow those bars look amazing! I’m so glad I could bring a little bit of home to you! Nelson may just be the prettiest little city in BC – I love visiting there!